What a day (so far)! After waking up well-rested at 8:30 and reliving another satiating homemade breakfast, we headed out into a chilly and rainy morning in Istanbul. We ambled around the hippodrome, which is home to a formidable handful of significant little landmarks, such as the Egyptian Obelisk (or the Obelisk of Theodosius); a spire-like statue that’s actually been brought down from Delphi; and some other minor monuments we failed to make note of but can be read about in more detail here. (I’m not sure which is cooler, the Milion, or the fountain gift from Kaiser Wilhelm. How neat is it to be able to casually stroll around pieces of architecture that have been around since the 10th century?) The Hippodrome also plays host to dozens of Turkish peddlers who will unfailingly shout at you and, if you’re lucky, follow you around asking if you’re from Somalia. 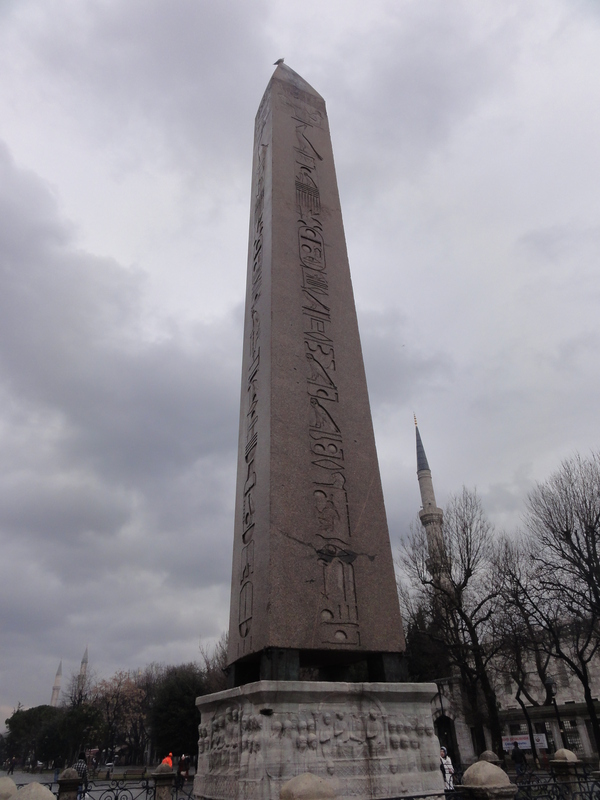 The Blue Mosque is located right next to the Hippodrome, so we anxiously climbed the steps only to be turned away, as it was prayer time. Bummed but still optimistic, we ventured a slight ways up the street to the Ayasofya Church, which was actually a monastery before it was a church, and a mosque after it was a church. The interior was lovely, but not quite as “majestic” as the Lonely Planet raved. 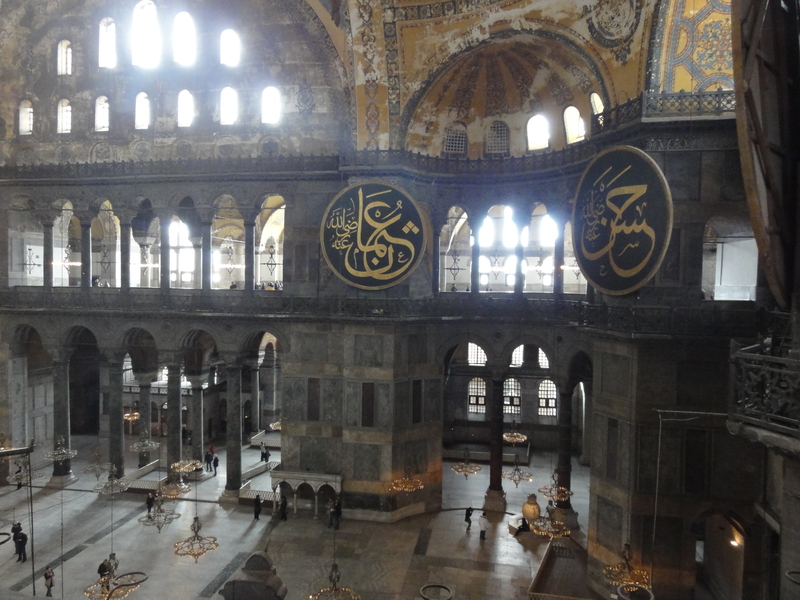 Still, the mosaics were nice, and Ayasofya was truly the paragon of Istanbul itself, a strange and lovely amalgam of East and West, Islam and Christianity. 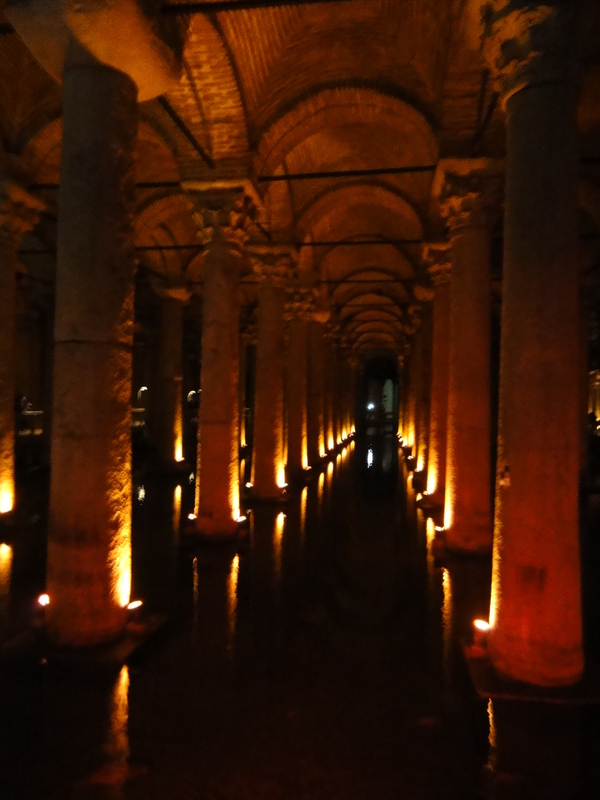 The sun peeked out from the cloud cover as we left and walked 40 meters up the street to the Basilica Cistern, which was dark and dimly lit (to be expected, as it’s underground). Aside from the abnormally large fish floating in its depths, it was very cool. Susannah is a fan of donning culturally relevant costumes in the places she visits, so we paid 12 Turkish Lira (about $6 US) to put on some authentic Turkish regalia and pose on a throne. 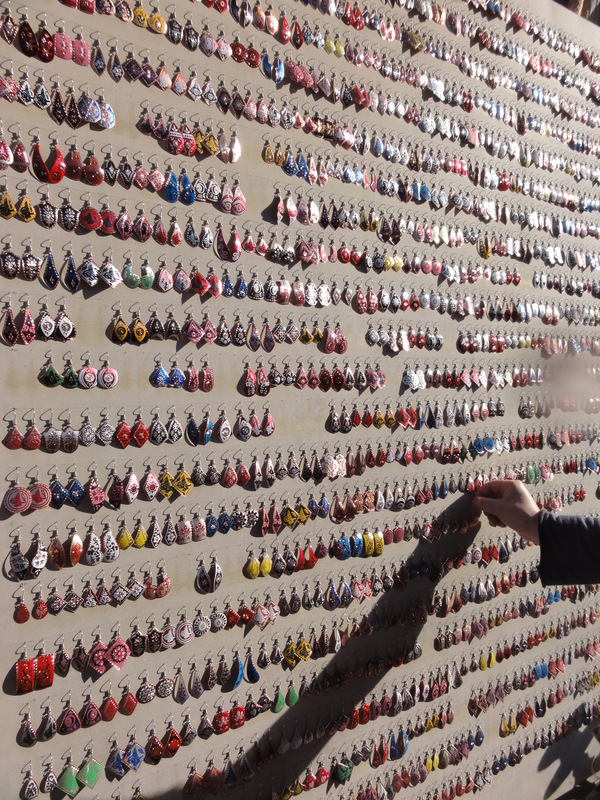 After touring the Basilica Cistern, we bought six pairs of earrings each at a sidewalk shop. Then we traveled just a bit further up the street to Topkapi Palace, which looked very beautiful in the afternoon sun. We also saw grass and nourished-looking animals, so we knew we weren’t in Cairo anymore (and we killed a witch on the way in, so that, too). Hungry and down to try some Turkish coffee, we stopped at a nice cafe with a creepy man outside who asked where we were from multiple times (we kept telling people Egypt, but they always replied with, ‘Are you sure?’ so we resorted to the truth. One man, to his delight, kept asking if we were from Somalia. Turkish humor?) 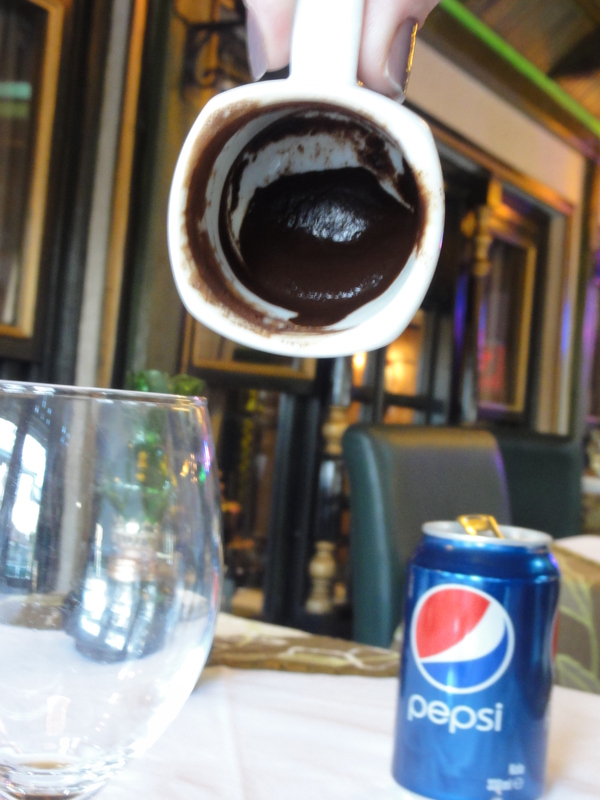 We feasted on kebab, hummus, and Turkish coffee, which was grainy and had the texture of potting soil. We took photos of each other sipping the sluggish beverage until we noticed the creepy man pressed up against the glass next to us. It was discomforting. This was magnified by our waiter’s constant, “Pleasure” in response to our thank you’s, which he spoke in several different ways, drawn out, gravelly, etc. 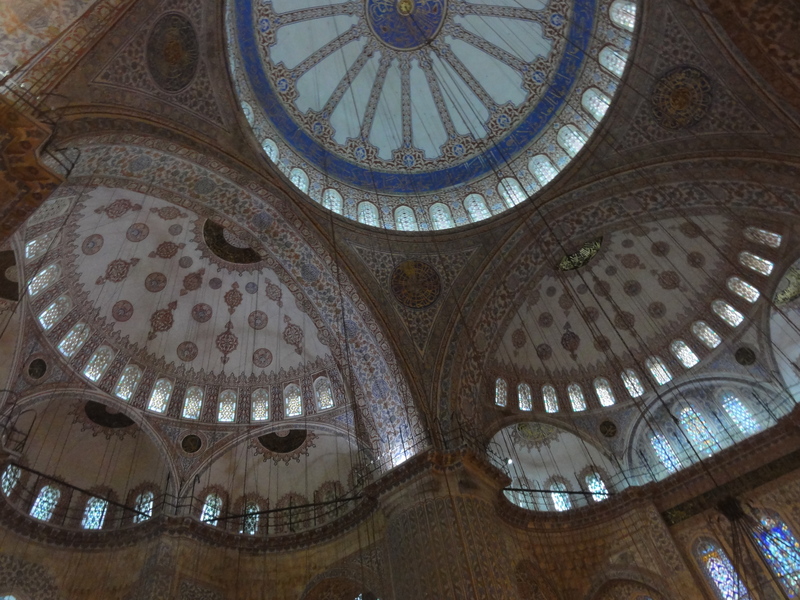 The Blue Mosque was breathtaking in both its architecture and its odor; the beauty of the arches and the blue designs swirling across the ceiling and down the pillars was offset by the pungent odor of feet that seemed to linger in the carpet. We’d removed our shoes and placed them in bags – a difficult task for Shannon, whose stylish boots required separate bags – and Susannah graciously gave me her extra pair of socks. It was enjoyable to stand on the plush carpets and tilt our heads back in awe at the rolling, domed ceilings overhead; it truly was grand and beautiful, although the hanging lights – which I’d been warned about – barred some of its original beauty. Thick, black cables make aesthetically pleasing mosques a bit less romantic. After snapping blue-tinted photos, we hit the streets and headed for our hostel, conveniently located down the street. Here we are, checking conversion rates. Shannon and Susannah are making useful TL to USD cheat sheets for our second forway to the bazaar to haggle before a late dinner. Off to score some (hopefully) cheap scarves, bowls, art, and bracelets before (hopefully) dining Anatolian style, aka on the floor. Okay, so there was no Bazaar (closed at 7) and no floor dining. We showered and decided to venture across the bridge (not the Europe-Asia trans-Bosphorus bridge) for dinner at a joint the Lonely Planet labeled a “top pick” called Sofyali 9. 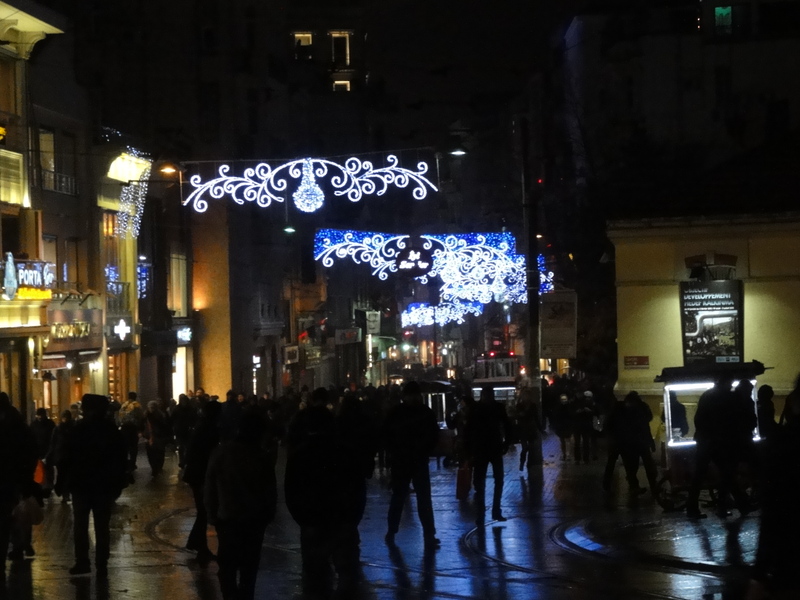 It started off nicely enough – we easily scored a cab and hopped out on Iskimat Street, an acclaimed local pedestrian road whose street-spanning blue lights reminded me of the wide webs hanging from streetlight’s in London’s Picadilly Circus before Christmas. It had begun to snow, the first real flakes I’d seen all winter (the gusty fans at Blue Mountain don’t count), and from inside the cab, they looked picturesque, lightly dancing in the blue glow of streetlamps. But once out of the warm safety of the cab, we instantly fell victim to the elements. The weather can best be described as blustery and bone-chilling (gnawing, really). While I delighted to see snowflakes nestling in my scarf, the raw, biting wind on my cheeks was unwelcome. My eyes teared and closed involuntarily, and I slipped on an ice patch; luckily, Susannah proved to be a sturdy and warm link between Shannon and me, and her grasp prevented me from breaking my tailbone. We ducked into a radiant candy shop to ask about the restaurant. A confused employee generously doled out three small, sweetly glazed rectangles of baclava, which we took with us as we huddled and walked briskly down the tram tracks to the odd cul-de-sac that led – thank God – to the restaurant. It was worthwhile. Toasty, warm with the smell of food, and not certainly not lacking in the hearty cuisine department, Sofyali 9 was the perfect spot. Susannah and I dined on hot, stick-to-your-pot lamb and veggie casserole. After dinner, despite feeling tired, we crossed the street to a cozy-looking hole-in-the-wall bar called Otto’s. The red glow gave it a cozy ambiance, and we scored prime real estate at the corner. This was the kind of bar that served its turbid drinks in tall glasses garnished with a formidable pile of matchstick carrots. Nonetheless, the ‘Kiss My Otto’ was zesty and fruity and made me feel warm. The whole place was warming, and it was quite the welcome contrast to the Arctic atmosphere outside. Inside, the orange-coil lamps burned dimly in what looked like upturned mason jars suspended from the ceiling; outside, the streetlights shone blinding and bulbous, catching the snow in its dizzying earthbound whirl. 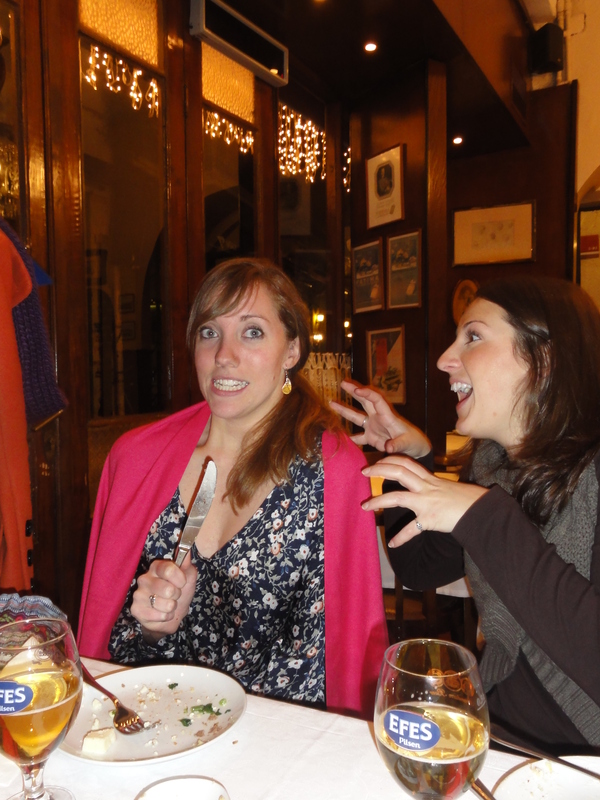 the maitre d' gave me a shawl, so shannon and i reenacted scenes from little red riding hood. We left after the bartender served us cloudy shots of vodka and mint. All in all, a very enjoyable night.